3.FAA registration is not required. 5.One key return : Remember it only works under headless mode, and needs to set the drone’s head in front before entering into headless mode. 6.3D Flip: Press the function button and push the right stick to any direction. Make sure the height is enough to perform a flip. 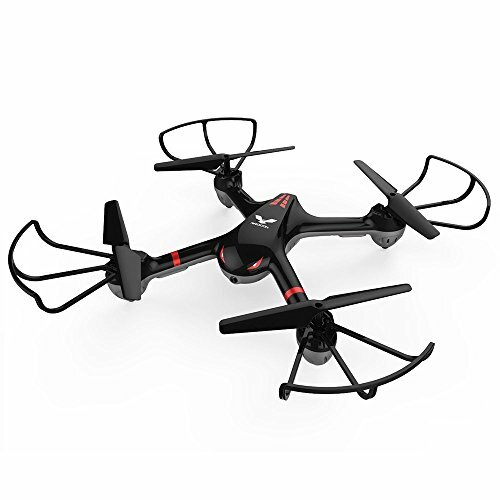 HIGH-QUALITY DRONE THAT'S GREAT FOR BEGINNERS: Take to the skies with this great value medium-sized drone.It's a great choice for those just starting their journey with drone flying. It's made of premium materials and comes at a fantastic price. ONE-KEY RETURN FOR EASY CONTROL: Never lose your drone again! The one-key return feature of this drone ensures you never have to worry about losing this drone. Wherever you are flying, just hit the one-key return button and it will return straight to you. ROLL PERFECT AND WONDERFUL: As drone 360～rolling specila effects surprise all the people. NO NEED TO WORRY ABOUT LOSING IT: Thanks to the headless mode, control of this drone is easy and you do not need to worry about the direction of the drone when flying it. You'll have total control for a straightforward flying experience.